At its annual symposium in Austin last October TMCA named Suzanne M. Duvall its Outstanding Credentialed Mediator of the Year for 2015. This is the first such award given by TMCA in its 15-year history. The award will become a regular part of the TMCA's yearly symposium and will honor outstanding credentialed mediators who have distinguished themselves in the mediation profession. 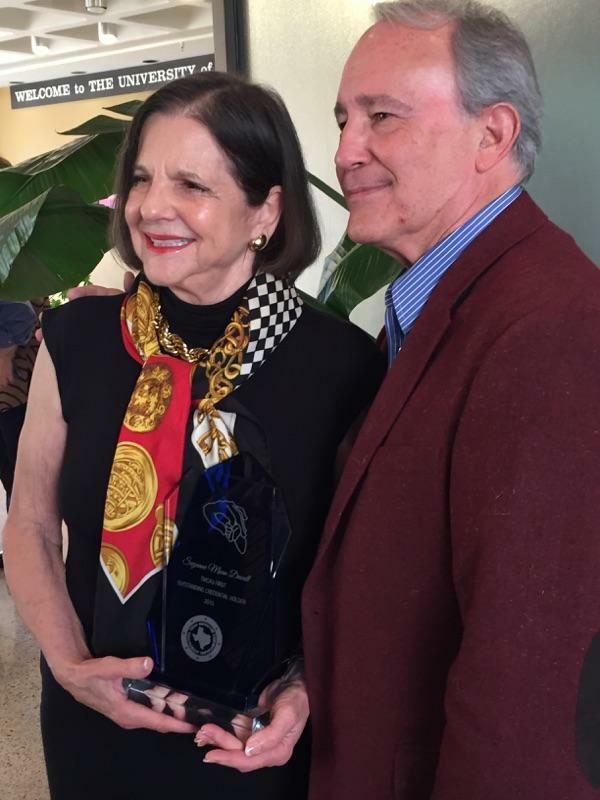 Among the many pioneering roles she has filled in Texas and national mediation organizations, Suzanne was a cofounder of the Texas Mediator Credentialing Association. As President of the ADR Section of the State Bar of Texas in 1996, Suzanne and 24 other mediation professionals were appointed to serve on the newly-created Texas Supreme Court’s Advisory Committee on Court-Annexed Mediations. The mission of the committee was to determine whether or not ethical standards could be established for mediators and if criteria for certification of mediators in Texas could be created. In 1998, the committee produced ethical guidelines for mediators which were approved and adopted by the Texas Supreme Court in 2005. Following the work of the Advisory Committee and its report to the Texas Supreme Court, the ADR Section of the State Bar of Texas undertook to determine whether there was support within the mediation profession for a credentialing process. All of the mediation organizations and associations were invited to provide input through representatives to serve on the newly-created Texas Mediator Credentialing Committee (TMCC) and Suzanne was appointed to chair that committee. Under her leadership, TMCC created the Texas Mediator Credentialing Association (TMCA) in 2001 and Suzanne was named chairperson of its initial Board of Directors. Subsequently, she served as board representative of the State Bar’s ADR Section and currently serves as the Trainers Representative. Ms. Duvall has received numerous awards for her mediation skills, leadership and service to the mediation profession including the Frank G. Evans Award given by the State Bar of Texas ADR Section for outstanding leadership in the field of dispute resolution, the first-ever American Arbitration Association Brutsche Award for Professional Excellence in Dispute Resolution, the Texas Association of Mediators Susanne Adams Award for Outstanding Commitment and Dedication to the Mediation Profession, and the Association of Attorney Mediators Pro Bono Service Award. She is the 2016 recipient of the Association of Attorney Mediators Steve Brutsche Award, the highest award given by this national organization. Suzanne’s leadership and service in the ADR field has included positions with the State Bar of Texas (former Member Board of Directors, Past Chair – ADR Section, Vice-Chair Professionalism Committee), Dallas Bar Association (Past Chair – ADR Section), Texas Mediator Credentialing Association (Founding Member, Past President, Current Board Member), Association of Attorney-Mediators (Past National Chair), Texas Association of Mediators (Past President, Current Board Member), Life Fellow, Texas Bar Foundation, Fellow, Center for Public Policy Dispute Resolution, UT School of Law (Master), Annette Stewart American Inn of Court. In addition to all of her other activities, Suzanne is the editor of the “Ethical Puzzler” column in the State Bar ADR Section newsletter—a position she has held for the past 14 years. Suzanne is a Dallas-based attorney-mediator who is affiliated with Burdin Mediations and mediates in Texas and across the country. She has been a full-time mediator for over 20 years and has mediated over 3,000 cases in all areas of civil disputes. She is also an experienced arbitrator and trainer in mediation.